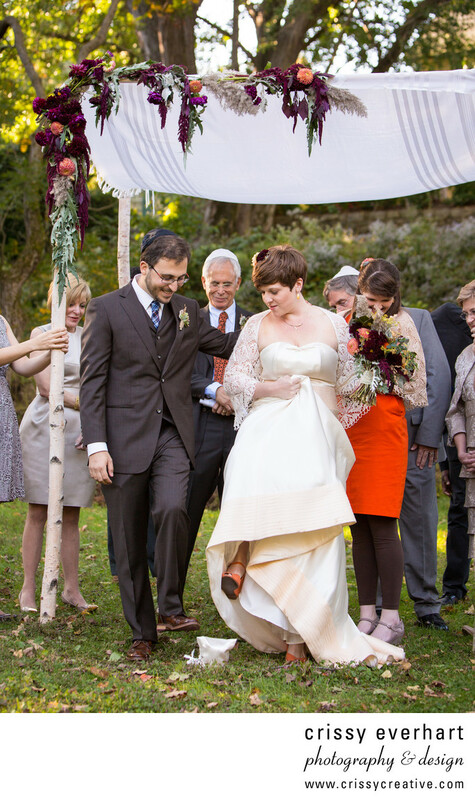 This unique ceremony celebrated the different backgrounds of the bride and groom. The groom is Jewish, so many Jewish traditions were incorporated, such as the breaking of the glass (shown here) and the chuppah they stood underneath. The Quaker tradition allows your friends and family to marry you, so both the bride's father and groom's father performed the ceremony and the mom and sisters all had readings. It was outdoors on a gorgeous fall day at Tyler Arboretum in Media, PA.